Russian ship sinks killing dozens. 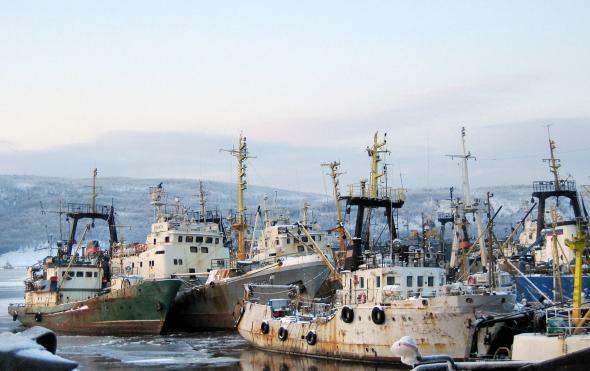 A picture taken Feb. 21, 2006 shows trawlers at port in Murmansk, Russia. A Russian ship sank late Wednesday night in the Sea of Okhotsk off Russia’s east coast near Japan, killing dozens. According to Russia Today, 54 people have been confirmed dead of the 132 thought to be onboard the Dalniy Vostok freezer trawler. More than 100 people were pulled from the icy waters, 63 of those recovered survived the shipwreck, according to Russian officials. Twenty more are still considered missing. Twenty-six vessels are working at the site to rescue the remaining crew members. An MI-8 rescue helicopter with four rescuers and medics on board was also deployed, according to local authorities, to search for survivors. However, the chances of survival in near-freezing waters after more than 20 minutes is nearly impossible, even wearing a wetsuit, rescuers say. All four rescue rafts seen at the site of the accident have been accounted for and all surviving crew have been brought up. Rescuers suspect that around 20 people on board Dalniy Vostok did not manage to make it to the rafts and sunk with the ship within minutes … The local branch of the ministry reported that the trawler sunk in about 15 minutes after its engine compartment had been flooded. According to a TASS emergency source, the ship did not even send a distress signal. According to information from the rescuers, many sailors on board Dalniy Vostok managed to put on rescue vests as the ship sank.